Normally words come easily over a cup of coffee and around 7 am but today they’re flowing easier than ever. I’ve been growing the prettiest Butterhead and Redina lettuce. I mean they’re beautiful. Well you’ve seen them in previous posts they were just little. They’ve been nurtured and growing great. I go out to the garden yesterday to cut some lettuce for a salad and my lettuce had been ate down to the ground. Freakin rabbits man. Let’s just say I believe my next post will be about how to utilize a rabbit from meat to pelt. I know I mentioned how destructive they can be in my raspberry post but just a reminder they will tear your garden up. I finally calmed down after I called my husband asking him if we had any rabbit gums because I wanted to catch the little booger. After he said no I decided we are going rabbit hunting… tonight. 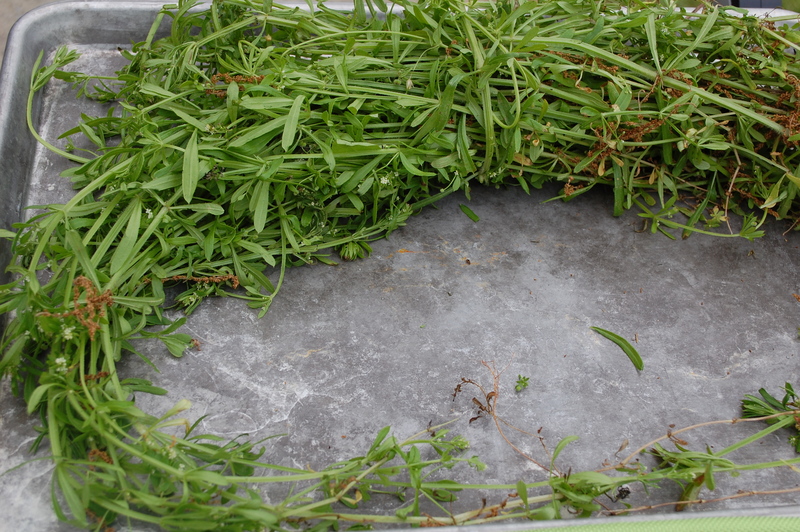 So cleavers… most people’s weed but a homesteaders go to remedy. Growing up my family made tea out of this herb to treat poison oak. We would even use the pulp to put directly on the poison oak. After drinking this tea years ago I haven’t gotten it since. Coincidence? Maybe.. maybe not. Either way I’m a believer. I remember my brother and I would examine our socks after our wooded expeditions and we’d have little green fuzz balls stuck to them. This was probably a dead giveaway to my mom that we had been somewhere we shouldn’t have. A thicket of woods and a couple of kids with vast imaginations meant hours of entertainment. For us of course and I’m sure the neighbors. As you feel the plant it feels sticky, has a square stalk, and is decorated with tiny green seed pods that will cling to almost anything. 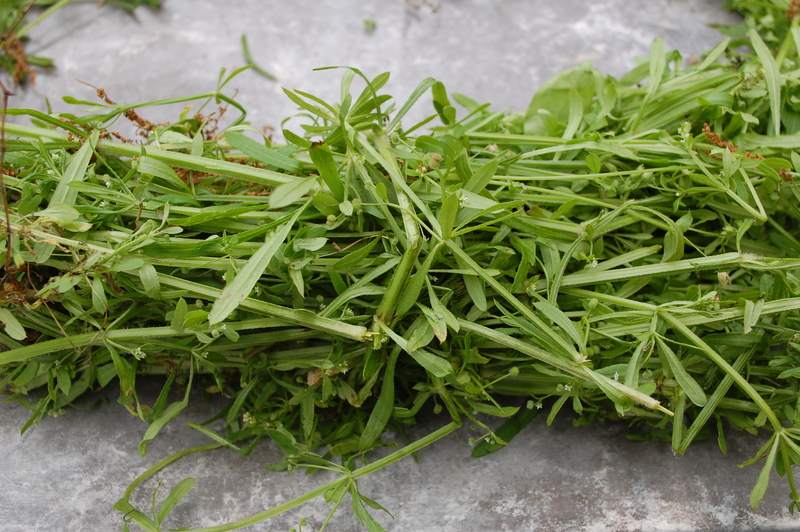 I’ve found a plant that looks similar but if it doesn’t have a square stalk or sticky it’s not cleavers. We would pick as much as we could hold in one hand then wash and dry it outside on the porch. After they were dry (it may take a few days) we would make tea out of it. You could speed that process up by putting it on a baking sheet in the oven on low until they’re dry. Be careful not to burn them! You can boil it in a pot of water (like you would tea) or put it in the coffee pot (as you would coffee.. filter and all) and fix it that way. If boiled you will need to strain it through a paper towel and strainer. Once boiled/brewed then dilute it with water and have it unsweetened or add honey or sugar and even lemon. It tastes a lot like regular tea just a little more earthy. After doing some research on cleavers before starting this post I realized that cleavers ability goes further than just treatment for poison oak. From a facial toner to skin rashes cleavers is a versatile herb. 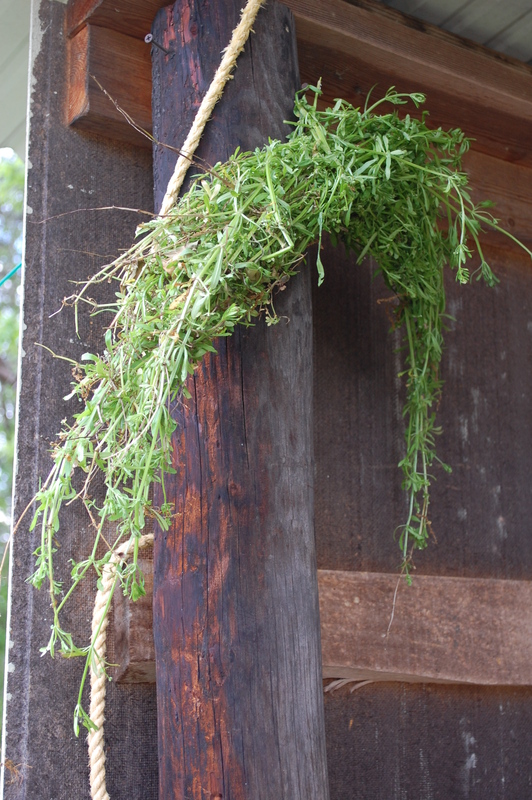 Keeping this Spring creeping herb in the medicine cabinet is a no brainer. You won’t find them in your living room. So get outside and start exploring! < Previous A birthday, Blowing Rock and a brooder box.